Starting this school year, Charlotte-Mecklenburg Schools (CMS) is launching two new Environmental STEM magnet programs. Our goal is to create an option for students to begin their environmental stewardship journeys as kindergartners at Bruns Elementary School and continue on through eighth-grade at Whitewater Middle School. After an extensive review of relevant whole school models and professional development providers, CMS chose to partner with Green Schools National Network (GSNN) to assist in implementing its Environmental STEM magnets. CMS selected GSNN because of its core values in supporting school leaders to develop and embrace a vision of sustainability that helps them transform their schools and communities; build the internal capacity to become a sustainable learning community and connect teachers and leaders to relevant resources and other educators doing similar work; and provide access to the Catalyst Network of highly implementing schools and school districts. Implementation of CMS’ Environmental STEM magnet programs is guided by the five core practices in GSNN’s GreenPrint for Green, Healthy, Sustainable Schools: curriculum that advances environmental literacy and sustainability; stewardship and service learning; sustainable facilities design and management; health and well-being; and strong partnerships and networks. To kick-off Whitewater Middle School and Bruns Elementary School’s transition to Environmental STEM magnet schools, GSNN Executive Director Jenny Seydel and School Coach David DenHartog spent three days leading leadership teams from both schools through a series of exercises and activities designed to guide their adoption of a sustainability mindset, shift focus to a more student-centered approach, and integrate social-emotional learning into daily teaching practices. The room hummed with excitement as the educators began to share their hopes and dreams for all that those children would accomplish in their futures. 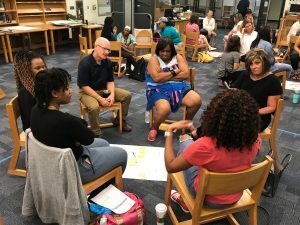 People shared that they wanted their daughters to be seen and known while at school; they hoped that their sons would be challenged and engaged; they hoped that their students would end up in teachers’ classrooms where relationships are prioritized. It was powerful to bear witness to the intentional student-centered launch of Whitewater’s magnet program. “Future creation” for middle-schoolers can’t be done alone, though; their voices must also be heard. Green Team leaders Meaghan Greene and Laura Thrash sought out student voice by asking students to write letters to their teachers about what they want for themselves, their school, and their futures. In those letters, students shared that they want to be happy and to be good people; they want teachers to challenge them and allow them to engage in hands-on learning; and they want to go to college and make their parents proud. The ability to choose the future is twofold: teachers at Whitewater Middle School are empowering students to choose their futures while simultaneously co-constructing the very magnet program that will allow that to happen. As Whitewater Middle School students begin to learn more about environmental sustainability, they will begin to see how they can choose their own futures by engaging in sustainable practices. 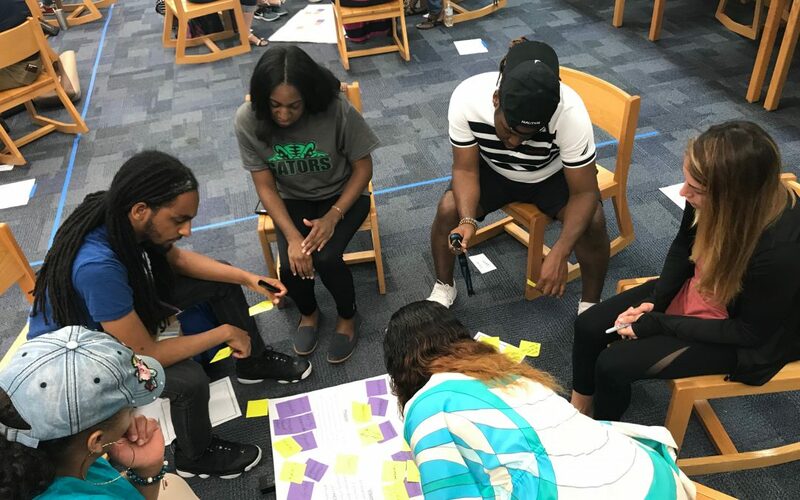 As teachers at Whitewater delved deeper into the “how” of this work, they began to connect their aspirations for students to unit plans for the coming school year. 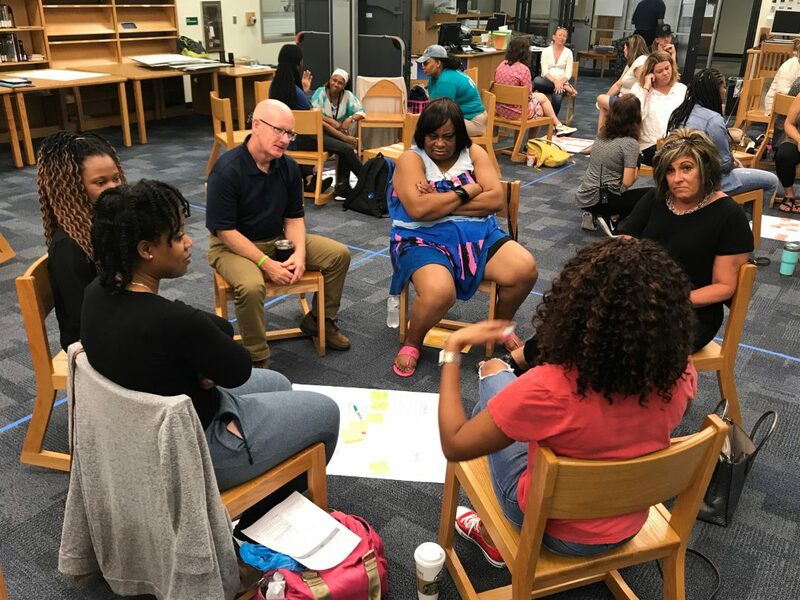 With a focus for the year on waste, teachers began developing units of inquiry that will allow students across grade levels to have an aligned focus on sustainability throughout the school year. 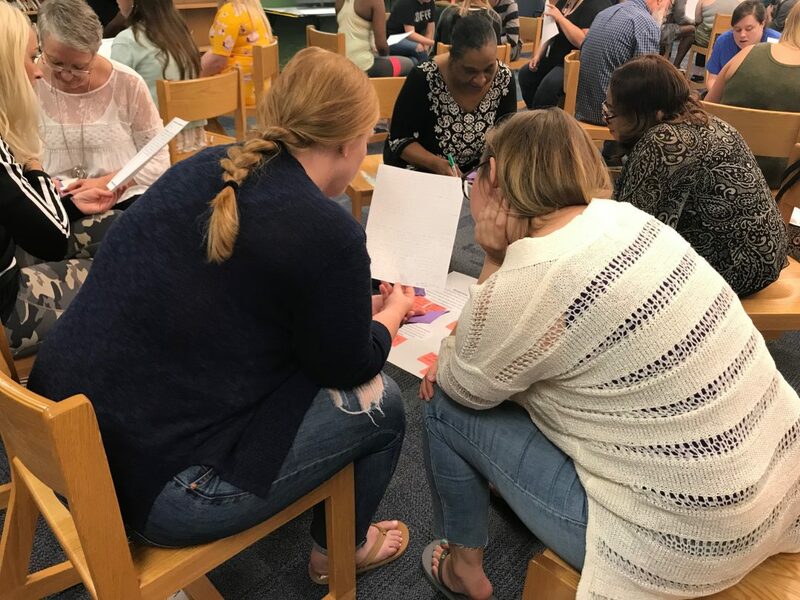 Down the road at Bruns Elementary School, teachers collaborated with the GSNN team to prepare for the launch of their own Environmental STEM magnet. The elementary school’s focus for the year is on recycling, and all grade levels will explore the concept through inquiry. 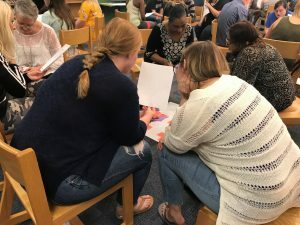 By investigating what phenomenon-based learning looks like in the elementary classroom, teachers are exploring ways to make learning come to life for the students of Bruns Elementary. The introduction of Environmental STEM as a magnet program is a natural progression in building on an established presence of successful STEM magnet programs at CMS. The new Environmental STEM magnet schools will provide CMS an opportunity to offer focused environmental education to students so that they may become lifelong environmental stewards, promoting and sustaining positive change in their communities so they can play a role in shaping their futures. CMS’ partnership with GSNN will allow Whitewater Middle School and Bruns Elementary School to focus on student academic growth and achievement through personalized learning, civic engagement and social justice, healthy living habits, and personal growth. In short, CMS and GSNN will partner to help students realize their goals of being happy and good, making their parents proud, and planning successful futures, all while engaging in hands-on learning that will grow them into environmental stewards who will make an impact on the world. Amanda Childress is a Magnet Programs Specialist in Charlotte-Mecklenburg Schools (CMS). She has served Durham Public Schools and the Wake County Public School System in the roles of teacher, magnet coordinator, and assistant principal. Amanda has most recently had the privilege of supporting new teachers in Title I schools in CMS. She is passionate about ensuring equity for all learners and believes deeply in the mission of magnet schools to create diverse schools that reflect their community.